The Jaish-e-Mohammad has claimed responsibility for the attack, which took place around 3.15 pm in Kashmir's Pulwama. 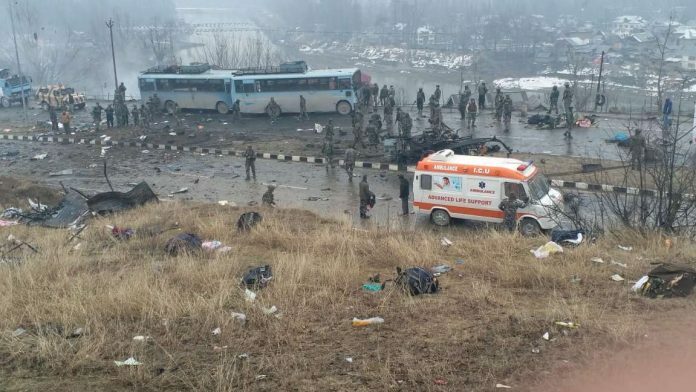 New Delhi: Thirty nine CRPF personnel were killed and several others sustained severe injuries as terrorists struck the bus they were travelling in with improvised explosive device (IEDs) on Thursday, Jammu & Kashmir Police sources said. The attack took place in Kashmir’s Pulwama district around 3.15 pm, at Awantipora’s Goripura. Banned terrorist organisation Jaish-e-Mohammed (JeM) has reportedly claimed responsibility for the attack. A video of the purported attacker was released by the outfit. According to a PTI report, the impact of the blast reduced the bus to a mangled heap. The IEDs were reportedly planted in a vehicle that was parked on the Jammu & Kashmir national highway. The vehicle is believed to have hit the bus as it was passing through the highway, with suspicions that this might be a suicide attack. However, it remains unclear how the blast was triggered. The IED attack was allegedly followed by firing. Prime Minister Narendra Modi condemned the “despicable” attack, and said the country stood “shoulder to shoulder with the families of the martyrs”. GNS, a local news service in Kashmir, put out a statement believed to be from the JeM, in which the terror group owns up to the act. The statement identified the driver of the vehicle, who carried out the “terrorist attack”, as “Aadil Ahmad alias Waqas commando of Gundibagh, Pulwama”. According to the CRPF, over 2,500 personnel were travelling on the highway in 78 vehicles when the attack took place. The bus that sustained maximum impact belonged to the 76 battalion of the CRPF and is believed to have been travelling with 39 personnel. Following the attack, security forces cordoned off the area and launched searches. Vehicular movement in the area has been suspended. Former Jammu & Kashmir chief minister Omar Abdullah was among those who issued immediate condemnations of the attack. The attack comes a day after news agency ANI quoted Minister of State for Home Affairs Kiren Rjiju as saying that apart from the attack on an Army camp in Uri, “the bomb blast and attack in some of the border areas like Pathankot”, there had been no major terror attack in India in the last four and a half years. “[It] Doesn’t mean there were no attempts, but pre-emptive action and arrests by intelligence agencies helped,” he added. Statistics, however, narrate a different story. Since 2014, more than 339 security personnel have lost their lives in over 1,708 terror incidents in Jammu & Kashmir alone. The number of terror incidents reported from Jammu & Kashmir has also been on the rise, with 2018 recording a 44 per cent jump. In 2017, 342 terror incidents were reported from Jammu & Kashmir, in which 40 civilians and 80 security personnel lost their lives. In 2018, the number of terror incidents rose to 614, with 38 civilian deaths and 91 security personnel getting killed. An ex gratia payment of one crore should be given to the bereaved families, part of it kept in a long term FD with the SBI. A job committed to each family, as and when some member qualifies for it by age. To say that the nation stands shoulder to shoulder with them must translate into at least a modicum of financial security, although the loss of the head of the family is a pain they will live with all their lives. Modi’s wrong policies are responsible for this. Heart rending. Condolences to the bereaved families, prayers for those who have been injured. What is deeply saddening is that this mounting toll is not taking us to the end of the tunnel.